This is a bit of a retro review, but since I’m in the process of putting together a talk about the design and testing aspects of sites as relates to accessibility, this came recommended as a good starting point. Many books that talk about designing for accessibility tell you a lot of the what and the way around accessible design, but don’t put much emphasis on the how. 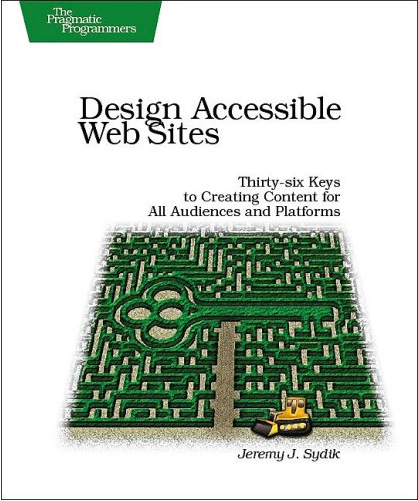 Jeremy Sydik’s book “Design Accessible Web Sites: Thirty-six Keys to Creating Content for All Audiences and Platforms" does an admirable job on explaining the "how" of accessible design. This book was originally published in 2007, so the technical underpinnings of the web have certainly changed a bit, but the overall message of “Design Accessible Web Sites” is still very relevant and still very usable. In the current rush for the latest and greatest, with frameworks abounding to handle just about every conceivable interaction, there comes a need for programmers and site designers to step back and consider if they are making it possible for the most people to use the sites and access the content they provide. Part 1 lays out the case for why accessibility is important (it’s good business, it;s the right thing to do, it’s the law in many places, and accessible sites are more usable for everyone). This section also steps through a variety of disabilities, some of which we automatically associate with Accessibility (visual, auditory and mobility impairments, as well as a variety of cognitive impairments and those who deal with a combination of the previous issues, specifically due to the results of aging). It also introduces the first eight “keys” of preparing for making an accessible site, including planning, making multiple access paths, avoiding the WET trap (WET stands for “Write Everything Twice”), and to set a solid foundation of accessibility testing, which really does require sapient skills to do. Automation can tell you if a tag is there or not, but it cannot tell you if a user experience for a disabled user is comparable to one for a normative user. Part 2 focuses on building a solid structure for your pages, with thirteen additional keys to help you design your pages with accessibility in mind, such as keeping the site design simple, removing style from structure as much as possible, using links effectively, designing interfaces that emphasize the selecting of elements and actions rather than drag and drop movement, breaking away from tables and creating forms that are easy to follow and intact with without losing their interactivity or power. Part 3 focuses on the visual aspects of the web, specifically how we deal with photographs and video clips. the nine keys in this section focus on selecting colors that contrast and don’t blend together, utilizing alt tags as more than just a place holder for generic text, and encouraging a design that can describe itself and allow the user to “see” the whole picture, or “hear” the whole story, even if those options are not on the table. Part 4 looks at some additional aspects of accessibility and rounds out the last six of the thirty-six keys with how to work with documents that are not traditional for the web, options for dealing with PDF files, scripted output, as well as with Flash and Java apps. Part 5 is a reference to a variety of web accessibility guidelines including WCAG, US Section 508, and examples from around the world, including Australia, Canada, European Union, Japan, United Kingdom, United Nations, etc. To design sites that are accessible, we have to think differently, but the differences need not be radical. Also, accessible design need not be boring design. There are plenty of techniques and approaches to use that will help make sites easier to interact with for a broad population, and for those willing to embrace this approach, having the capability of designing sites that are accessible could be a differentiator for you as compared to other designers, programmers and testers. As the tenth principle says, "As you encounter new web technologies, apply these same principles when making them accessible.” Technology moves on, but the advice and methodology is still sound, making ‘Design Accessible Web Sites” an evergreen title to consider for years to come. Do You Want to Move Testing Forward?